The legend of Santa Claus, the jolly fat man who visits good little children on Christmas Eve, has its basis in reality. Saint Nicholas lived in the fourth century AD in the town of Myra in Asia Minor, now known as Turkey. As a child, he grew up impoverished; later in life, he inherited wealth and spread it, with joy. Nicholas was a bishop renowned for helping children and sailors as well the poor, the latter through anonymous gifts of money. Many stories have been told about his generosity, but the most famous involved his placement of unexpected gifts in stockings hung by fireplaces to dry out in the cold, wet winter months. This is a custom that we repeat today, so many centuries later, in Saint Nicholas’ honor. The tale of the stockings revolved around a poverty-stricken man who had three daughters. The man was so poor that he lacked the money for his daughters’ dowries; in those days, women could not hope to marry without their families’ bestowing gifts of money upon their future husbands. One night, as the legend goes, Nicholas dropped a bag of gold coins down the chimney of this man. The bag fell into a stocking that was hanging on mantel to dry. When the gift was discovered, the eldest daughter laid plans for a happy marriage. The magic coins were discovered once again when it came time for the second daughter to marry. Determined to find the anonymous gift giver, the girls’ father hid every night near the fireplace, until he surprised Nicholas who had reappeared to help the last daughter. The generous donor pleaded with the man not to reveal his identity, but word leaked to the community. Afterwards, whenever someone in Myra received a gift anonymously, they knew that it had come from Nicholas. Another story tells of Nicholas helping a group of sailors battling a violent storm off the coast of Turkey. Terrified, the sailors prayed to Saint Nicholas to help them. Suddenly, he appeared in their midst. Like Jesus before him, he ordered the storm to abate and the sea obeyed. During the persecution of Christians, Nicholas was exiled from Myra and imprisoned by the Emperor Diocletian. He died on December 6th sometime during the period between 345 and 352 AD. In 1807, Italian merchant seamen unearthed his bones in Turkey. Reverently, they ferried the remains to Bari, Italy where they are venerated in San Nicola, the cathedral named for him. After his death, because of his acts of kindness, Nicholas was canonized and known the world over as the Patron Saint of Children and Sailors. Every year on the Feast of Saint Nicholas (December 6th), the sailors of Bari carry a statue of Saint Nicholas out to sea to bless the waters for safe passages throughout the coming year. As part of The Cloisters Collection, a painting entitled Saint Nicholas Saving Seafarers can be found in New York City’s famed Metropolitan Museum of Art. As truth is always stranger than fiction, Nicholas’ story was embroidered with each telling as it was passed down through the ages. Eventually, his name became synonymous with the spirit of Christmas; in his honor, we hang stockings and exchange presents with friends and loved ones on Christ’s birthday. Here in America, we altered his name to Santa Claus and removed him from dangerous straits. We positioned him on frozen terra firma, at the North Pole, where he resides with his Mrs. and oversees a horde of industrious, toy-making elves, which have probably been unionized by now. Once a year, Santa Claus commandeers a sleigh driven by eight reindeer, including one with a glowing red nose to navigate through snowy skies (thereby negating the sailors’ need for “a star to steer her by”). 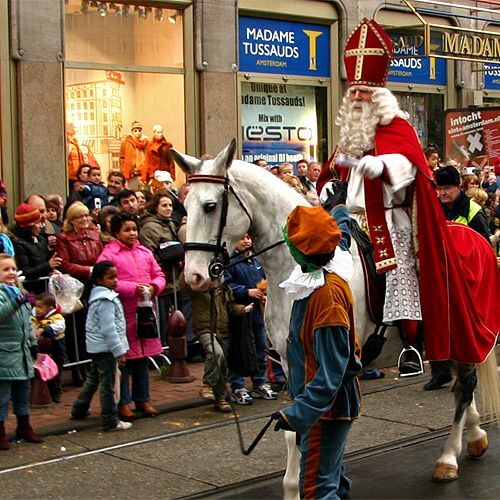 In legend, Saint Nicholas may have ventured far from his native Turkey. But every Christmas Eve, he is very close to the hearts of Christian children, young and old.